When you have a child with Celiac Disease, the most important time to be sure they feel included in the dessert department is on special occasions. While my eleven-year-old son was diagnosed over six years ago, and eating gluten-free is routine for him, it’s still no fun if he’s at a party and there’s no gluten-free dessert option. And I learned early on, it’s not just about having a substitute—it should be an equally cool substitute! For example, if everyone at the party is having cupcakes with an awesome video game figure on top, eating a plain gluten-free brownie is nowhere near as exciting. 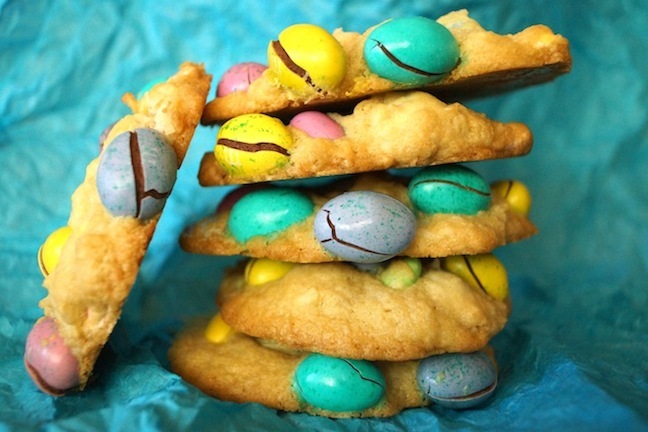 This Easter, no gluten-free kid who gets one of these Ultimate Gluten Free Easter Cookies will feel left out. In fact, those eating the other gluten-full desserts will want in on them. Watch out! GF kiddos (and adults!) won't be left disappointed this year if you bake up a batch of these wheat-free cookies! Step 1: Preheat the oven to 350 degrees F and line a couple of baking sheets with parchment paper. Step 2: In a large mixing bowl, combine the softened butter with the sugar and vanilla. Once it's blended, add the eggs and mix until it's smooth. Step 3: In another bowl, mix the flour, xanthan gum, and salt. 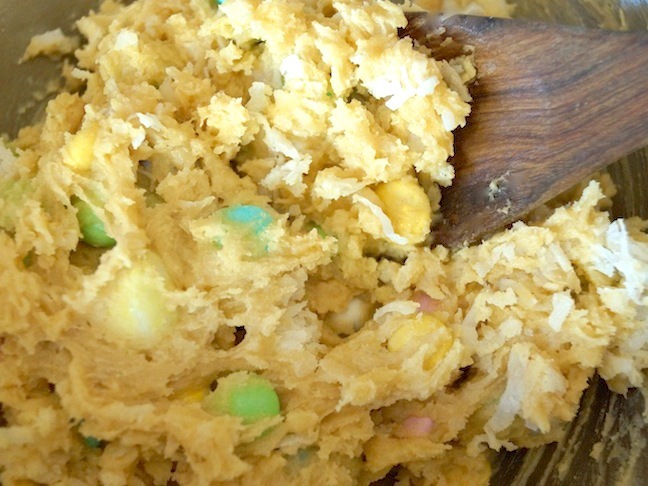 Once blended, fold this into the wet mixture. Step 4: Now fold in the coconut and the 2 cups of the pastel-colored chocolate candies. Step 5: Use a cookie scoop or tablespoon to shape the cookies into about 1½ tablespoon dollops, at least 2 inches apart on the parchment-lined baking sheets. 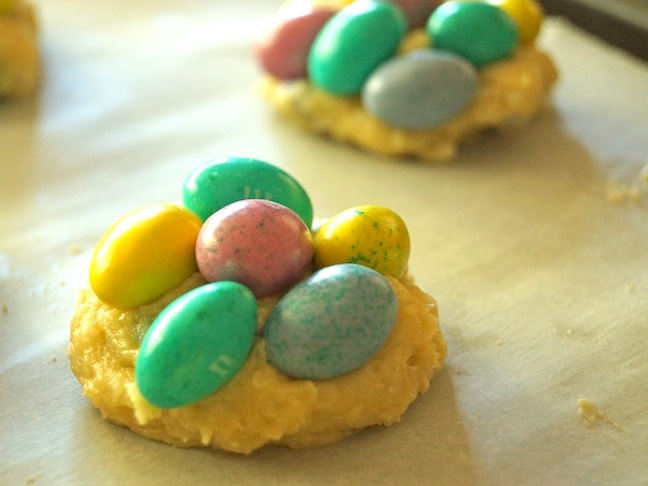 Step 6: Gently press some Easter M&Ms into the the tops of the dollops of dough, dividing the 2 cups amongst all of them. Step 7: Bake in the preheated 350 degree F oven just until the cookies solidify, 10 to 12 minutes. Leave them on the baking sheet for a couple minutes, then transfer them to a cooling rack. 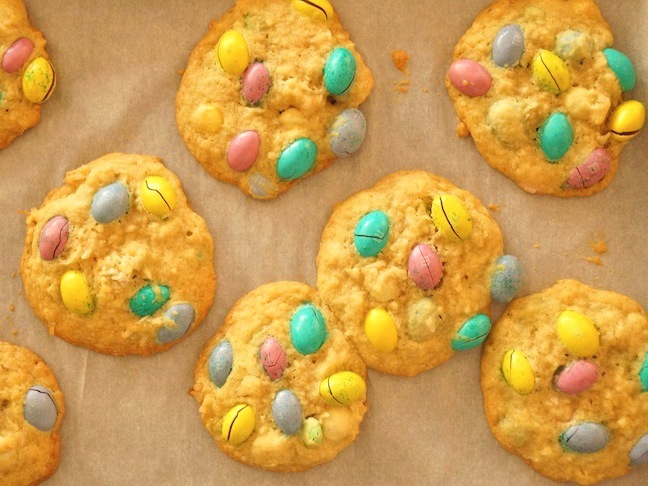 Notes: I find that M&Ms are the best for the tops of the cookies because the color doesn't bleed when they bake, and there's minimal cracking.